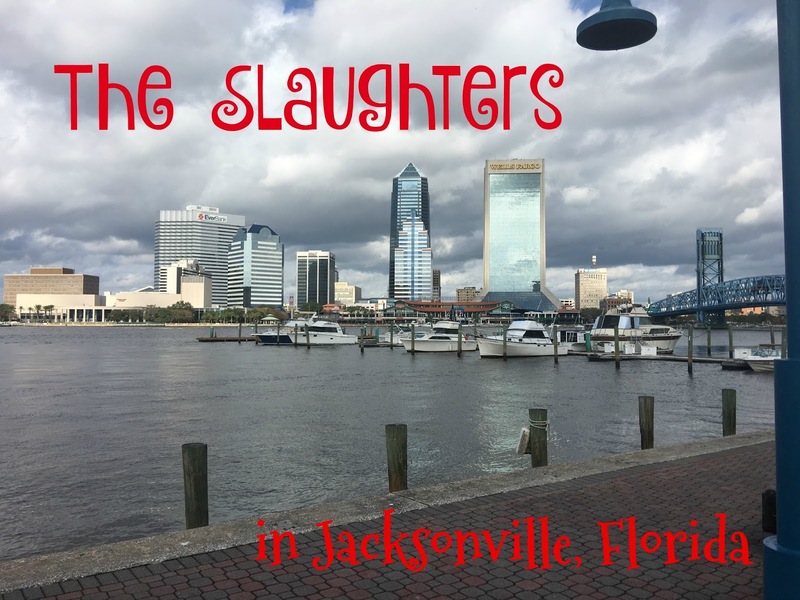 Tab and I just got back yesterday from sunny (and partly cloudy) Jacksonville, Florida. Tab officiated the TaxSlayer Bowl on New Year's Eve between Kentucky and Georgia Tech. For bowl games officials are asked to arrive two days prior to the game to ensure everyone makes it in time. We left on Thursday bright and early for a kid-free couple days and an awesome football game. After lunch we walked over to the Jacksonville Landing (right beside our hotel) to check it out. Most of the stores were closed during the day so we made a spur of the moment decision to head to a local spa! After we napped! haha! I'm not even kidding! :) These are my favorite leggings to travel in, paired with my favorite long tank, a comfy cardigan, and these tennis shoes. We grabbed an Uber for our ride over to the spa and it was the first time either of us has had a negative Uber experience. Have you guys ever had a bad Uber? This car SMELLED! He was super nice, but the car was a mess. He was eating a bag of potato chips, which would be hard to do while driving so you can just imagine how chips were getting all over him. Right? It was an experience! We finally made it to the spa and we relaxed for an hour! Then we had the world's best Uber driver on the way back to the hotel. He was an immigrant from Cuba who's been a U.S. citizen for the last ten years. He was so proud to be an American. I was tearing up listening to him speak about our country. Sometimes being born here in America it's something we can easily take for granted. His little speech spoke straight to my heart. We showered and quickly got ready for the bowl dinner. I wore a pair of black jeans, leather coat (sold out), and booties. (sold out). I should have taken a picture of the spread...salads, zucchini, bruschetta, chicken parmesan, Tuscan chicken, and lasagna. SO GOOD! And then they brought the most delicious cheesecake. The sweet guy next to me kept adding more to my plate when I wasn't paying attention AND I kept eating it. The restaurant was looking all kinds of festive. Friday morning we slept in!! Glorious! And headed STRAIGHT to your recommended Maple Street Biscuit Company. Holy Yum that place was good! Thank you to everyone who mentioned it. We talked to the manager while we were waiting to order and after we ordered he brought us these cinnamon roll/biscuits with pecans that were heavenly! You guys! This food was SO GOOD! It was my favorite meal in Jacksonville! I got the biscuit with fried chicken, goat cheese, and pepper jelly! I mean. Delicious! Big smiles because that brunch was divine! Then we drove to the Atlantic Beach area to check out the shops. This store (I can't remember the name and can't read it in the picture) was all edible, natural products used to make soaps, candles, lotions, etc. The company was on Shark Tank and Barbara was the one who put up some money. Casual outfit for shopping by the beach...flannel and jeans. Night out number two was another outfit, another yummy restaurant. Top, jacket (sold out), jeans, and booties (45% off). On this night, there was a boat parade with fireworks right on the river by our hotel. We decided to head with a smaller group over to the Landing area to eat and hopefully see the festivities from our table. This area was FULL of fans! And then when we were finished with dinner I looked out the window (see my reflection) to see this! Until fireworks started showering OFF the BRIDGE! It was a SIGHT! Before we knew it, it was GAME DAY! Top (sold out), my favorite long tank, jeans (sold out), and similar booties (this is the same style-super comfy). The guy's shuttle for the game left at 7:15! Yes, 7:15! I opted to walk to the stadium since it was so close. A group of us left around 9:30. These were the other wives I was hanging with for the day. We had tickets to the tailgate party beside the stadium so we stopped there for a quick bite. You guys know I have a thing about over dressing because I'd much prefer to be a bit warm rather than freezing. I had to take off a few layers once we got to our seats. The singing of the National Anthem gave me all the chills...all the veterans in the stadium were asked to salute so I could see men and women all around me saluting, when "the rockets red glare" was sung fireworks went off, and the group of Marines singing were awesome. Someone on the crew had made reservations for us all at Benny's (where we ate the night before), so we headed back for night number two. On this night I had a shrimp pasta and wasn't disappointed! At night the Landing was full of lights, people, and fun! Lo, Kelly, and cute baby, Boulder, were headed to Amarillo so we got to spend the morning with them and the flight to Dallas. And then in a blink, we were on the flight home headed back to our three crazies. A HUGE thank you to my parents who held down the fort and made sure everyone was taken care of. And to my mom-who kept the laundry all caught up! AHHH!! THANK YOU! THANK YOU! THANK YOU! Jacksonville is such a cool city. I'm glad you had a great time!!! Your outfit choices are on point and I'm drooling over that jacket on your second night picture! Happy 2017! Thanks, Leslie! I couldn't agree more-it was a cool city! Happy 2017! What a fun trip!!! I loved everything about it (besides the Uber ride). I want to go now just for the food ;)! So happy you're home! Sounds like a perfect little getaway! Happy new year! Loved waking up to your post today! So fun meeting you. Looks like you all had a great trip too! KRISTIN! It was SO nice to meet you! Happy 2017!! Man! It's hard to eat breakfast when I keep wanting all the fried things ;) Sounds like a great trip! Happy New Year, friend! What a fun trip! Looks liken you had a blast! And, all of the food sounds amazing! So much fun!! Jacksonville is such a fun city. Glad y'all had a great weekend!! I see that your tank is a maternity tank (at least as pictured in your link). Do you just get a smaller size? Love your blog ! I loved the white top you wore your first night out. Do you remember where you got it? Thanks for the recap! It's always fun to see the other side of the bowl and what the officials do! Glad y'all had a kid free weekend! You ever see the SNL skit with Justin Timberlake? Biscuitville? You taking about how yummy they are makes me 'sing' Heading down to Biscuitville in my head...lol...looks delicious! No, I actually get my regular size. Thank you! Yes, it was Topshop from Nordstrom but I couldn't find it online. Yes, I feel the same about seeing your bowl recaps. Hahaha! No, but I should have been singing it!! This looks like soooo much fun!! We watched Tab on tv!! What a fun way to end 2016! Super fun trip!!! If you're ever back, Sea Island and St Simons aren't too far from there! Super quaint places!!! What a fun trip! I'd be right there with you- I love fried seafood!!!!! I love to read your blog and was surprised to see the picture of Lo, Kelly and Boulder! I am from Amarillo and have known them for years!! What a small world?! So much fun!!!!!! Tab has a fun little gig going!!! so glad you get to travel with him! I think I need to go there just for those biscuits!!!! Yum! What a fun little getaway!!! What a weekend! We love Jax!! There's so much to do there! Maple Street Biscuit Co is one of our favorites as well. We have been to the one in Chattanooga but I look forward to going in Jacksonville on our next trip. Jacksonville is a super fun place. Happy New Year to you and your sweet family. God bless!